Hi. David are you from Bedford? I have found the aroma of plastic macs is only when they are new and sadly soon fades away. For the first time in years, I am now the proud owner of a genuine men's black/grey Pakamac. It's been years since I last owned one and to be honest, after many fruitless bidding attempts on eBay, I thought that I was destined never to own a Pakamac again. It's not like I remember the ones I wore as a boy. It seems so much lighter than I recall. Certainly, a lot lighter than the many other plastic macs that I own, even the ones I have from the 1950s. I was surprised to find that it doesn't have a lovely vinyl aroma either. Maybe my nose is just too jaded from age. Believe it or not, I'm saving putting it on for an occasion when I wear it for my boyfriend (you know who you are)! 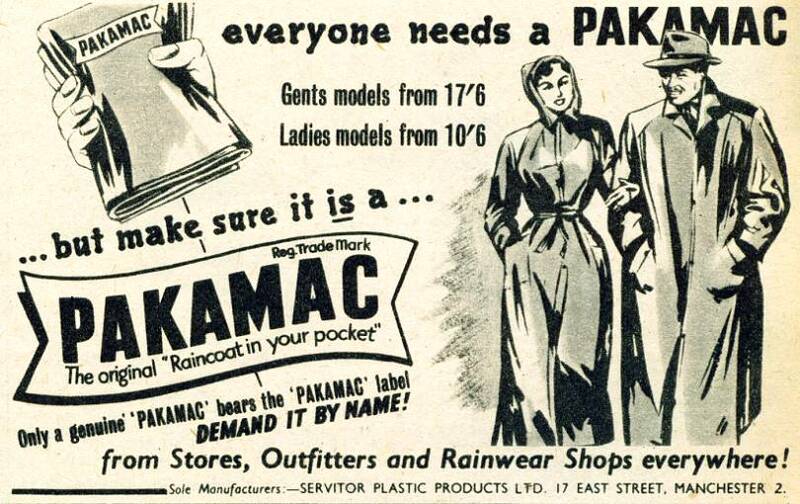 I know that I am guilty of using the name pakamac as a generic word for some of my beloved foldaway raincoats, especially my vintage macs. However, I take exception when sellers use Pakamac to advertise their macs, plastic or nylon, when selling their goods. Often, I look at these macs and think straight away that it's not genuine. Genuine Pakamac mac adverts will take advantage of including a photo of the coat label. Does anyone else have a view on use of the name? Hi all its been some time since l left a comment but l do read it regularly. I have followed all your comments on the different makes of plastic and nylon mackintoshes and would like to give you my input on my experiences in the 60s. It's interesting reading the comment here regarding the Rainstar nylon mac and how thin it could be. I was only just thinking about that myself but just what a difference that made to me when I wear one. I love it for it's thin feel that blows about and billows up so much, in the wind. For me it adds to the joy I feel wearing it when I'm out whether I'm wearing it over the smartest of skirt suits or relaxed over a chunky cardigan. I look down at the delightfully thin navy blue nylon material belted or unbelted and the distinctive pretty buttons and feel in heaven. Well, Ken, I certainly stand corrected having read Susan's post. Perhaps I should seek them out. Ken, I'd love to know what happened to the Rainstar label. I used to buy loads of their nylon macs in the 1980s and 90s. I do remember that I also had a Rainstar polka dot, hooded, see through plastic mac. I remember the plastic packaging that they were all sold in, were very like the ones Pakamac sold their macs in. At the time, I thought Rainstar had come from Pakamac but maybe they just emulated the packaging and styles. Rainstar macs slowly disappeared, replaced by the YB Wet label. I bought my last Rainstar from a small shop, which was closing down, in 2004. They seemed to have a good stock of them but the shop was gone 3 weeks later. The ladies YB Wet nylon macs were exactly the same as Rainstar down to the styling, hidden hoods, belts and buttons. Apart from the name, the packaging was exactly the same. Slowly, they changed the material to a slightly thicker nylon, which unfortunately creased more easily, they changed the button style but included a spare and the belt was better finished. I don't know what happened to that label either. Those macs too disappeared from the shops that I frequented. I bought my last one, in a ladieswear shop in 2010. Don't know of their history, but I have owned one, perhaps two, in the past. Whilst all the features are there, the half moon pockets, and the nice buttons, but if memory serves, the nylon was a little thin, and lacked the noisy rustle that the Pakamac brand could boast. Try and get your hands on an old C&A mac, or Dunn&Co, a particular favourite of mine. The "mackintosh" debate has really started something. I would to go mackintoshing with Charlie Anne Wray. How many of you have made her virtual acquaintance? Thank you for that Brian. We are now keeping this magical word in the public arena, and hopefully more will use it rather than the more common abbreviated version. I was glad that you used the word with a lower case 'm', since to use the upper case,'Mackintosh' refers to the particular brand, and the lower case 'mackintosh' is n fact a generic term for any type of raincoat. It is lamentable that we see very few of these items out and about, although, and you referred in your message to ebay, they are widely available. Mmmmmm,but mackintosh is a thrilling word. Apart from anything else,they were the original makers of those lovely Quality Street chocolates. But, in a waterproof context, the nearest items to the original rubber-lined garments, are those fabulous rubber-proofed satin creations by Lakeland Elements. Not to mention the gorgeous Charlie Ann Wray, who frequently models them. However, they are prohibitively expensive. The sole item in my wardrobes of this nature is a royal blue metallic mackintosh, proofed by black rubber. It cost some £400, and is the most expensive item I have. Many of you have mentioned the scarcity of the original 50s and 60s items-sadly all too true. But keep looking at e-bay. If you are in a buying mood-and what waterproof enthusiast isn't?-you will always find something of interest. Not only have I never been disappointed with any of my purchases, but I have frequently forged good relationships with the vendors. Thank you for your contribution on this thread Susan, it seem's I'm not as alone a I'd thought. Yes, you're correct Hugh, mackintosh is a wonderful word that for me, conjures up such wonderful feelings. I'm partial to all words describing raincoats, particularly 'plastic mac' and 'nylon mac' but replace mac with mackintosh and the feelings just grow. Yes Beverly, we have similar memories. I have read several of your posts and you are among the few who helps keep the word alive. Thank you! Hello everyone. I'm a late-comer to this feed, although I have enjoyed reading the posts for some time. I was just hoping that anyone on here would like to engage in a discussion about the root of our passion? I have been drawn to nylon mackintoshes since early childhood and would be interested to know of your story? I remember as a 10 year old in the mid 1960s wearing a (black?) plastic pakamac. I loved wearing it as often as possible. There was a girl living nearby who I was friends with who also wore plastic. Sometimes we played a game when wearing our pakamacs that we called "shake".We would shake each other, or shake ourselves! Our other friends thought we were "shook" when they saw us, but we didn't mind. The thing is, are we going to get a summer this year? I use one of my favourite words yet again-Brrrrrrrr!!! Does anyone on here lament the decline in use of the word mackintosh? Mac, raincoat, trenchcoat are fine, but mackintosh has such a ring to it. It need not necessarily refer to the rubber coat we all know. Mackintosh with upper case 'M' is after all a rand name. But mackintosh with lower case 'm' is a generic term for any type of raincoat, whatever the fabric. I, of course, am dedicated to the nylon pakamac type mackintosh. Yes we are surprised that you can't find them in more shops because they are perfect for our summers! Sorry I can't remember it is made by RAIN but they are ladies. We get asked this a lot Richard and we did find somewhere last summer. Its on our comment in July if it helps. I find it has to be cold for it to be comfortable enough to sleep all night in a plastic mac. A nylon mac can be worn most nights except perhaps for the warmest summer. Like Berverley, I wear them to sleep in on most nights. There was a typing error in my last post. The appropriate word is Brrrrrr!! I can say only one word to Beverly Mr-"Br&#341;rrrrrrrrr!!". so cold sleep in my nylon mackintosh over nightie.in house in day plastic mackintosh over full clothes. Definitely NOT Pakamac weather today, for wearing, kissing, or WHATEVER!! No mention of pakamacs here!!! Can anyone remember the first time they kissed a girl wearing a pac a mac? jamie where you still made to wear your pakamc when in your teens . were you embarressed about wearing your pakamac. did you ask to be aloud out without your plastic pakamac n hood. Bev. There were plenty of warm sunny summer days that my parents would dress me warm for. Others would be running around in summer dresses and I would be wearing my Mac and Wellingtons, often with the hood up and a scarf. Love the comment from Jamie as i recall pakamacs at first had hoods.From early age had dreams of being made to wear plastic mac with hood . like jamie even in fine weather. in my dreams on sunny days i would be made fun of. would ask mum to let me off wearing my plastic mac n hood when fine but to no avail ,Bev. John,if you after a brand new nylon mac,buttoned,collared,in the traditional Pakamac style,you may have problems. However,such items do turn up regularly on e-bay,and they are almost invariably in excellent condition. Alternatively,you would do well to consider "Stay Dry Rainwear". They stock excellent,low-priced nylon macs,in both navy and black. They have both zips and popper fastening and attached hoods. The seams and general workmanship are, admittedly, a little crude, compared with Pakamac's excellent standards, but they are beautifully relaxing and comfortable to wear. I don't think you will be disappointed. Of course,if you are like myself and my fellow enthusiasts,you will probably try both routes! Just "follow the yellow-brick road", and let us know how you fare. Best wishes!